Secant piles are cantilever piles having a nature of continuous pile walls. This is cantilever pile having a continuous pile wall. It is made by the intersection of one pile with another to form structural wall. The wall resists lateral pressures and groundwater inflow for bulkhead support, earth retention, groundwater control, or slope stability. The pile is bored cast, in situ concrete pile having diameter ranging from 450mm to 1200mm. Primary pile, also known as male pile is installed first and reinforced either with steel bars or steel beams. Once it gains sufficient strength, secondary pile, also known as female pile is installed in between the primary piles. This is used in unsuitable ground i.e. even in boulder strata or where the water table is generally high. Normally secant piling overlap is 100 to 150mm. 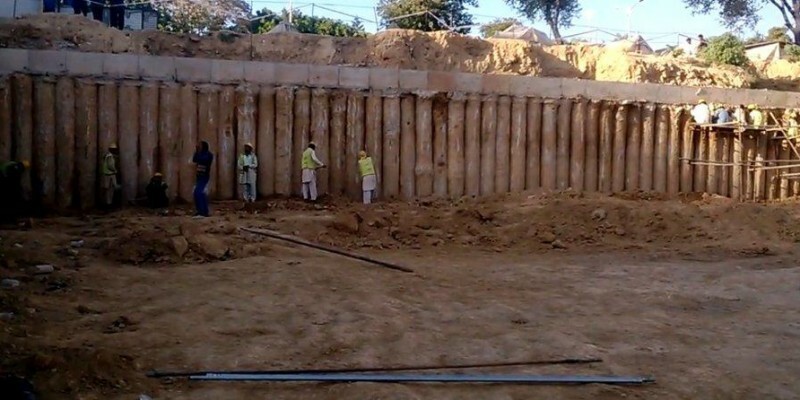 The purpose of the secant piled wall is to ensure that the ground or composition behind the wall is securely and safely held in place despite its lateral and downward pressure against the retaining structure. Minimal ground disturbance to adjacent structure. Excavations kept sufficiently dry that dewatering is not essential. Can be incorporated into permanent works to form part of the structural foundations. Can be used as a temporary structure.